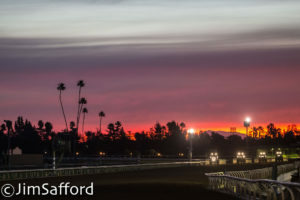 Santa Anita morning. Photo: Jim Safford. The first big event of the day is the sixth — the $300,000 American Pharoah Stakes (GI). 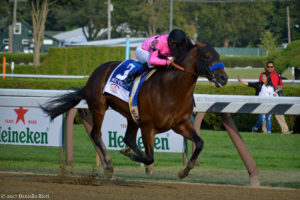 Originally contested as the Norfolk Stakes when Oak Tree maintained the fall racing dates, then the Frontrunner Stakes for a handful of years, it’s now named for the 12th Triple Crown winner, who won the race in 2014 and was trained by the race’s leading trainer in Hall of Famer Bob Baffert. 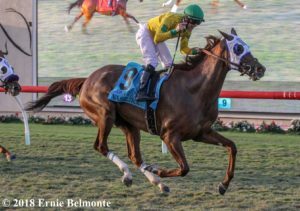 Seeking his eighth win in the 1 1/16-mile feature, which guarantees a spot for the Nov. 2 Breeders’ Cup Juvenile (GI) at Churchill Downs to the winner, Baffert will tighten the girth on the Gary and Mary West’s Del Mar Futurity (GI) winner Game Winner. Trainer Jerry Hollendorfer sends out the talented pair of Del Mar Futurity runner-up Rowayton and maiden winner Gunmetal Gray. Rounding out the field is red-hot owner Hronis Racing’s Sigalert and a talented maiden from the Keith Desormeaux barn named Jefe. Other notable names to have won the Norfolk/Frontrunner/American Pharoah through the years include Nyquist, Lookin at Lucky, Dixie Union, Free House, Bretrando, Best Pal, Capote, Snow Chief, Chief’s Crown and Flying Paster. Post time for the American Pharoah Stakes has been set for 2:36 p.m. PT. 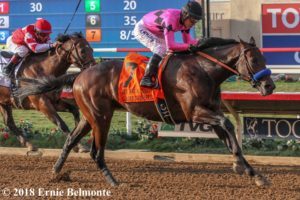 Bellafinal wins the 2018 Sorrento Stakes at Del Mar. Photo: Ernie Belmonte Jr.
Six fillies will go postward in the $300,000 Chandelier Stakes (GI) looking for a guaranteed spot in the Breeders’ Cup Juvenile Fillies (GI) at Churchill Downs in five weeks. Kaleem Shah’s streaking Bellafina, who took the Sorrento Stakes (GII) and Del Mar Debutante (GI), returns as the favorite. The $800,000 daughter of Quality Road makes her two-turn debut, but it’s hard to imagine — given the ease of her previous wins coupled with her pedigree — that she’d have any issue with added ground. Baffert, looking for his 11th winner to extend his margin on D. Wayne Lukas’ nine winners, sends out a pair in Del Mar Debutante runner-up Mother Mother and maiden winner Der Lu. The former, who drew the rail, was a $450,000 yearling purchase and the daughter of Pioneerof the Nile is looking for her initial stakes win. 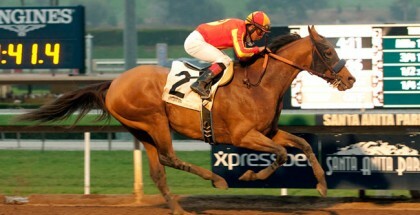 The latter, a $900,000 daughter of Orb, is facing winners for the first time under red-hot jockey Drayden Van Dyke. 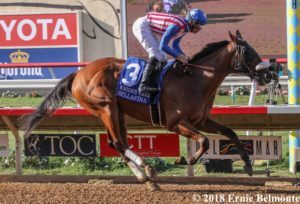 Completing the Chandelier Stakes field will be recent maiden winner Vibrance, the promising Brill from Jerry Hollendorfer’s barn, and the maiden Del Mar May, who is trained by Richard Baltas. Some famous Chandelier Stakes (and, formerly, the Oak Leaf Stakes) winners include Sporting Lass, It’s In The Air, Bold ‘n Determined, Landaluce, Life’s Magic, Sacahuista, Lite Light, Serena’s Song, Chilukki, Halfbridled, Sweet Catomine, Stardom Bound, Blind Luck, Songbird and Moonshine Memories. Post time for the Chandelier Stakes has been set at 4:07 p.m. PT. A spot in the gate for the Breeders’ Cup Filly & Mare Turf (GIT) is up for grabs in the running of the $300,000 Rodeo Drive Stakes (GIT), which has been carded as the 10th of the day. Eight fillies and mares are expected to race the 1 ¼ miles over the turf course, headed by the Jerry Hollendorfer-trained Vasilika and the Tom Proctor-condisitoned Cambodia. 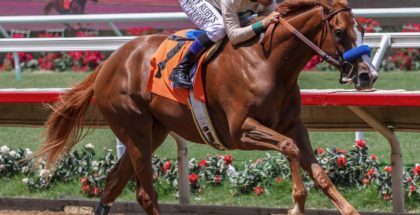 The two most recently finished one-two in the John C. Mabee Stakes (GIIT) at Del Mar, the former having worn a claiming tag for most of her career before earning her initial graded stakes win last out. The latter is a four-time graded stakes winner, but will be seeking her first Grade I win in the Rodeo Drive in what will be her first-ever start at Santa Anita. Honeymoon Stakes (GIIT) winner Paved will lead the field to post and will also be joined by recent European shipper Tisbutadream, Grade 2 turf winner Beau Recall, multiple stakes-placed Queen Blossom, graded stakes-placed Amboseli and Gamely Stakes (GIT) winner Sophie P.
Since champion Estrapade won the Yellow Ribbon for the connections of Charlie Whittingham, Allen Paulson and Bill Shoemaker in 1985 some really good turf distaffers have returned the winner of the Yellow Ribbon/Rodeo Drive, including Brown Bess, Kostroma, Possibly Perfect, Ryafan, Fiji, Spanish Fern, Golden Apples, Megahertz, Wait a While (twice), Nashoba’s Key, Marketing Mix and Avenge. The Rodeo Drive will leave the gate at 4:41 p.m. PT. The final and main event is the 12th race, the Awesome Again Stakes (GI) for handicap stars. The nine-furlong, main-track test, which guarantees the winner a spot in the Nov. 3 Breeders’ Cup Classic (GI), drew a field of six and all but one are significantly accomplished runners, with the other being a former claimer on the rise. The race also marks the long-awaited return of champion West Coast, who hasn’t raced since his runner-up finish to Thunder Snow in the Dubai World Cup (GI) back in March. Baffert will seek to break his five-win tie with Charlie Whittingham when he saddles Gary and Mary West’s bay colt. The Awesome Again was contested originally as the Goodwood Stakes in honor of the Oak Tree Racing Association’s sister track, Goodwood Racecourse in England, but has been contested in the name of Frank Stronach’s 1998 Breeders’ Cup Classic (GI) winner, who only raced twice in California, since 2012. 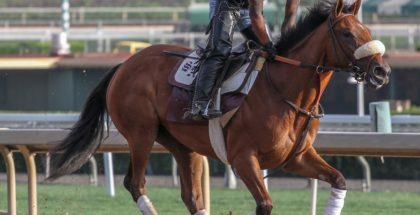 In addition to the comebacking West Coast, who won last year’s Travers Stakes (GI) and Pennsylvania Derby (GI), the field will be highlighted by the presence of Pacific Classic (GI) winner Accelerate, who also won the Gold Cup at Santa Anita (GI). With jockey Victor Espinoza still recovering from a broken neck, Joel Rosario will again be in town for the mount. The Awesome Again also lured All American Handicap (GIIIT) winner The Lieutenant, without a win in four months, but a nice second in the Suburban Handicap (GII) in New York. Native Diver Stakes (GIII) winner Prime Attraction is another without a win in a while who will give a challenge to the top two. Rounding out the field are Isotherm, making his second main-track start in a while after having most of his success (including graded stakes triumphs) on the turf, and former $12,500 claimer Shades of Victory, who is coming off his score in the Buddy Johnston Stakes at Los Alamitos. Ferdinand and Super Diamond won this race in the 1980s and, though champion Bertrando won in 1994, the race became a significant Breeders’ Cup Classic prep when Kentucky Derby (GI) winner and reigning Dubai World Cup winner Silver Charm won in 1998 en route to a second in the Breeders’ Cup Classic. Tiznow then won in 2000 en route to his first Breeders’ Cup Classic win and runners to have followed to victory include Pleasantly Perfect (twice), Lava Man, Well Armed, Game On Dude (twice), Shared Belief and California Chrome. 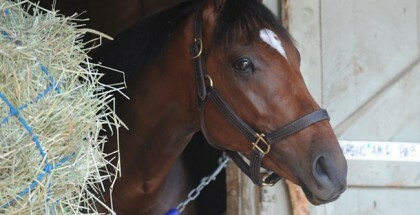 The Awesome Again is scheduled to break from the gate at 5:12 p.m. PT.